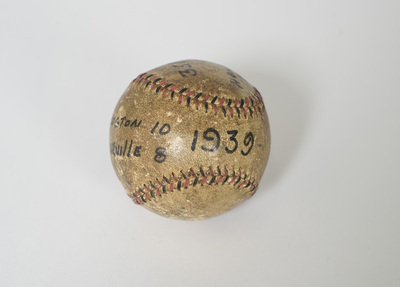 Baseball from the 1939 Cedarville-Wilmington game. The name Clyde Walker is written on the ball. He was apparently the honorary captain of the team ("honary [sic] captain" is written on the ball), having sustained a knee injury in a basketball game earlier in the year (see the 1939 Cedrus yearbook) which made it impossible for him to play baseball. Also written on the ball is "358 Bat. Average" and the score of the game: Wilmington - 10; Cedarville - 8. Clyde Walker is mentioned several times in the yearbook, including his senior picture.